Before meeting SodaStream at BritMums and then having this for review I had never tasted a drink made from SodaStream before. Ashley on the other hand, has fond memories of having SodaStream to drink at his Grans when he was younger. I had contemplated purchasing one, but would just instead go to the drinks aisle and buy lots of fizzy drinks. I drink a lot of fizzy drinks, especially since having Jack mainly for convenience. When I attended BritMums Live back in June, I was introduced to the SodaStream and got to taste their drinks. I think that was what made me decide that actually they are no different to fizzy drinks. 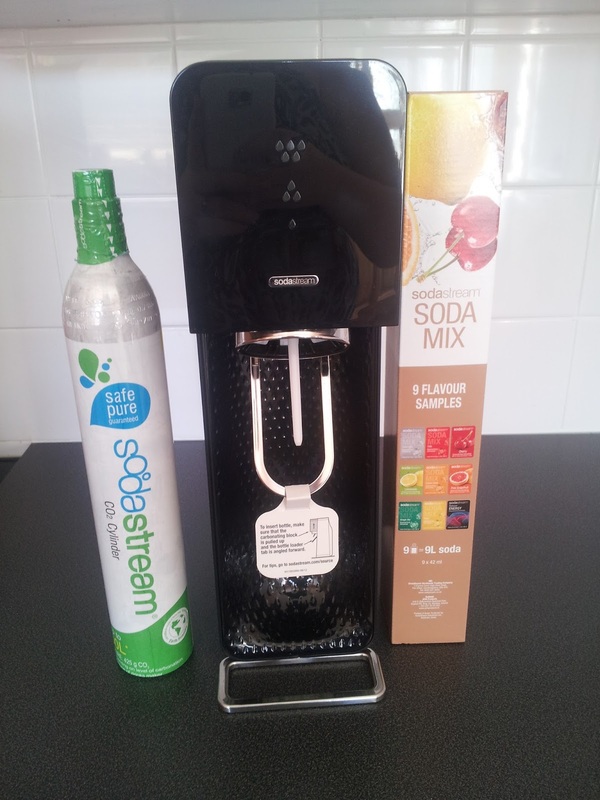 SodaStream are the leading brand in home carbonated soft drinks. SodaStream are retailed in a vast majority of stores across the world, making them the worlds leading brand. SodaStream traces back to 1903 when Guy Gilbey invented the first ever SodaStream machine. As the 20th Century developed, SodaStream machines gradually became smaller and featured in more and more homes. Now, each year SodaStream provides over 600 million litres of carbonated beverages to more than 10 million households. 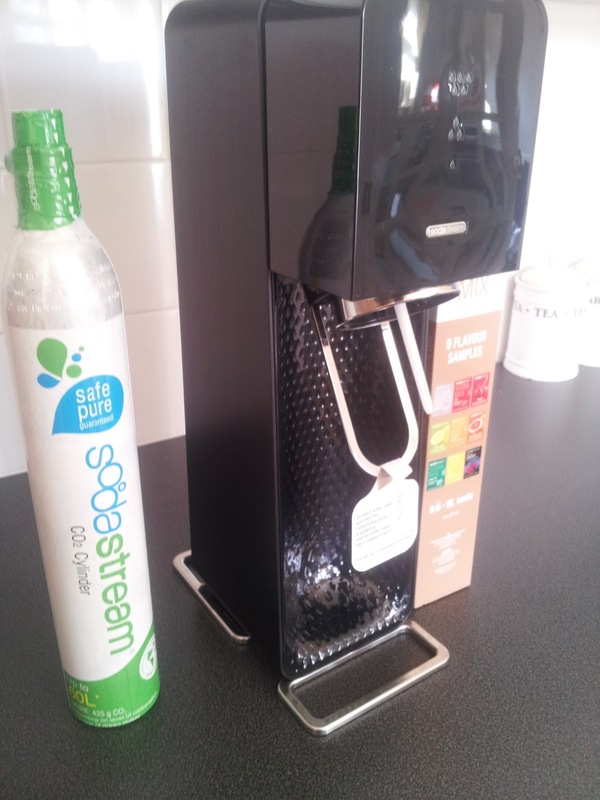 We were recently sent a SodaStream to review, we received the Source Metal Edition in Black, perfect to fit in with our kitchen! When unboxing the SodaStream Source, the quality of the machine stood out, it was a lovely shiny finished and required little putting together. We were sent the SodaStream machine, a gas cylinder, pack of tester syrups, SodaStream bottle and a few larger bottles and mixers to try out. To put the machine together, you simply remove the bottle from the back and place the gas cylinder in its place. Simply twist the cylinder until it locks in place and your SodaStream machine is ready to use. You then fill up the bottle with cold tap water up until the stated line. Once the bottle is filled, you place it upwards against the machine, push it towards the back of the machine and it will then lock in place. Firstly I was trying to screw the bottle in and wondered why it wouldn't secure - the previous is why! No effort or strength is required to lock the bottle in place making it simple to use. The Drinksmaker has an attractive, space-saving design that sits elegantly on any kitchen work top. It also features an LED interface to identify when your water is fully carbonated and an intuitive snap-lock bottle mechanism for effortless preparation. The SodaStream Source is designed by interior designer Yves Béhar, with features to make it attractive and simple to use. To carbonate your water you simply dress down on the top of the machine and decide what level of fizz you would like. There are 3 different levels indicated by the water droplet lights. Depending what drink I am making depends how fizzy I like it. When you release the machine there is a realease of gas, which can be a bit worring at first but it is normal. Jack enjoys to watch the bubbles fill up within the cylinder - which is quite fun. Once you have your desired level of sparkling water, you simply add the syrup of the flavouring you require. I advise you to pour the syrup in slowly as it can cause the water to fizz over, like when you shake a fizzy bottle and open it. You can then simply pour into a glass and enjoy. The SodaStream is portable, and is small enough to take out on daytrips with you. Also, there is no-more plastic bottle to throw away as you simply have one bottle to rinse out after each use. Over the period of time we have been using the SodaStream I have really enjoyed it, it tastes just as good as fizzy drinks, and works out cheaper. There are so many flavours of syrup to choose from. Each syrup costs around £3.49 and makes up to 12 litres of carbonated drink. SodaStream's are available to purchase from the SodaStream website, if you follow their Facebook and Twitter feeds they often run promotions on their products.